Gladwell's new book has received some lukewarm reviews from the big newspapers. His main message is that those who succeed are able to do so because of the culture they live in and because of lucky accidents, and innate ability is far less important than we often think. Reviewers have pointed out that hardly anyone really thinks that success or failure is always just a matter of innate ability or lack of it, and so Gladwell is pointing out the obvious. They have also complained that Gladwell's examples are often over simplified and his explanations are not always the best available. The critics are probably right, but they miss the point. Gladwell is a popularizer of science, and he has a knack for setting out modern science in an appealing way. Even if he doesn't get the details completely right, his main message -- that we should care about our society as a whole and the opportunities we give people rather than simply say that those with the ability will succeed anyway -- is salutary and appealing. Good popularizers are not writing scientific tomes, and they have to simplify discoveries in order to get them across. Listening to the unabridged audiobook of Outliers, read by Gladwell himself, is an enjoyable experience. I found myself thinking about successful people I know and of how I teach my own students in ways that I would not have done if I had not listened to the book. His examples are varied: Canadian hockey players, musicians, computer software billionaires, nineteenth century American business magnates, Korean air pilots, Asian people doing mathematics. Gladwell says that success and failure is not a matter of genetics or innate genius, but of far more random factors, such as opportunities available to people, their abilities to take advantage of opportunities, small differences that lead into large differences between people, and cultural history. He argues that the Asian traditions of growing rice which require so much determination and hard work all year round mean that those cultures promote hard work in other areas of life, and this work ethic results in a better performance in mathematics. It's obvious that any such proposed explanation of a "racial" difference will be controversial, and that Gladwell's preferred explanation will be hard to prove. But his explanation of the why most Canadian junior hockey league players were born in January is far more compelling. As a whole, the book is provocative, but hardly makes an ironclad case against the importance of genetics in many cases of success. How could he? But he does nudge us in the direction of being more ready to look for cultural explanations of success, and to be suspicious of individualistic stories. 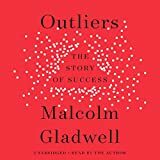 Outliers is an easy listen on audiobook, and Gladwell reads his own work with conviction and vivacity.